Koko Crater is one of my very favorite iconic spots on the island Oahu so it was a total delight to see it wrapped in a soft rainbow yesterday. 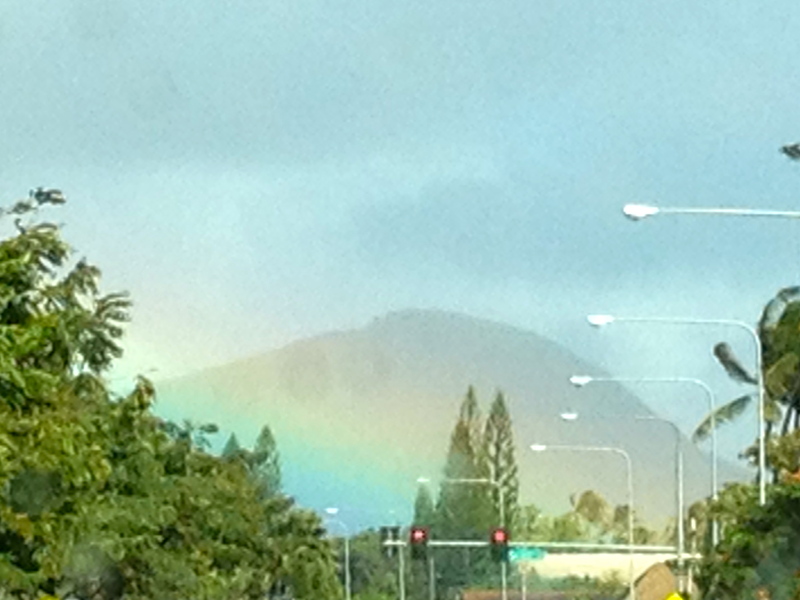 In fact, God, my mother and I were seeing one rainbow after another on our ride home from the dentist. Some were like this one . . . so low to the ground that we both marveled. What I desperately wanted was a camera to be mounted on my glasses that I could activate by a hard blink. Hear that, Apple? Maybe next year? But, in truth, what I should be recording is not so much rainbows as time with my mother. My mom is an Appreciator. Since I was old enough to walk around the block with her she has been pointing out things for me to appreciate. What an incredible gift to give to a child! I like to think that I have become an Appreciator — but, then my late dad was an Enjoyer — a World Class Enjoyer. And I am in no position to judge which gift I employ more. Both parents had good senses of humor, too. I remember my father telling me that, “You HAVE to learn to laugh at yourself.” Such wise words. Laughter aerates the soul — laughter at oneself and at the human condition. I’m pretty sure, God, that You laugh too.